AS IT STANDS: Betsy DeVos Is The Most Unqualified Education Secretary Ever Nominated ...Period! 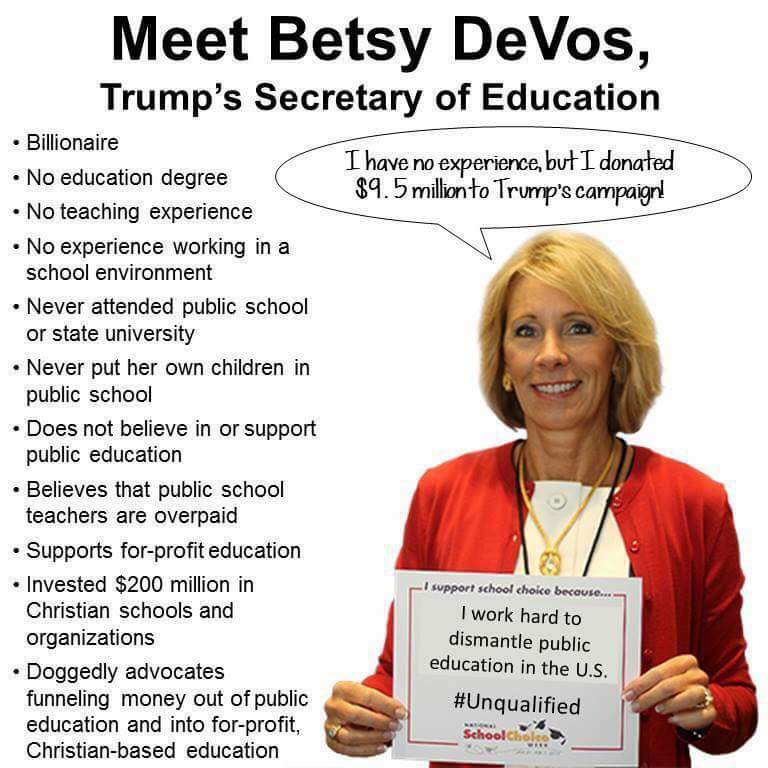 Betsy DeVos Is The Most Unqualified Education Secretary Ever Nominated ...Period! In the latest attempt to put a wolf in the chicken coop, Trump's nominee for education secretary, Betsy DeVos, is having a hard time getting confirmed. After her dismal performance in front of the Senate Health, Labor and Pension Committee (HELP) on January 17th, she found herself up against ethics violations. Here's the report. Talk about conflicts of interest! Her investments (in 102 companies) sheds new light on her ethics. 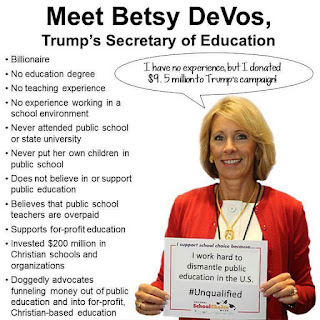 Fact: Billionaire Betsy and hubby have spent millions advancing radical school privatization, including taxpayer vouchers for private and religious schools, and helping politicians get elected across the nation who were willing to advance their elite agenda. Fact: Betsy doesn't have an ounce of experience for the job. Imagine if you were to apply for a position this big and you didn't have ANY experience. None. Nada. You'd be laughed right out of the room. Senator Elizabeth Warren grilled Betsy and exposed her total lack of credentials during the hearing. "It is already unquestionable that Betsy DeVos is the most unqualified Education Secretary nominee in our nation's history, but it is clear that if she is confirmed, she will make the student debt crisis exponentially worse," said Scot Ross of One Wisconsin Now, who has pushed for meaningful solutions in the state of Wisconsin. Trump's attempt to undermine public education by nominating DeVos is a blatant attempt to deny education for the poor and minorities. His love of under-educated supporters is a matter of record.